Draft is a tool built for developers who do their dev work against a Kubernetes environment (whether it be a live cluster of a Minikube instance). It really helps speed up development time by helping out with the code -> build -> run -> test dev cycle. It does this by scaffolding out a Dockerfile and Helm Chart template pack customised for your app with a single command and then by building and deploying your application image to your Kubernetes environment with a second. First off, make sure you have already set up your kubectl configuration to be able to talk to your Kubernetes cluster, and have also setup and configured Helm. Set the Draft binary up in a known system path on your machine after downloading it from the Draft Releases page. Run draft init to initialise Draft. It’ll drop it’s configuration in a subdirectory of your user profile directory called .draft. Create a new .NET Core 2.1 ASP.net project and select Web API as the type. At this point you could run draft up and if you have a container registry setup for Draft on your machine already, it would build and push your Docker image and then deploy your app into Kubernetes. However, if you don’t yet have a container registry setup for Draft you’ll need to do that first. PS, just make sure your local development machine has credentials setup for your container registry. E.g. Docker Hub. Awesome. Draft built your application into a Docker image, pushed that image up to your container registry and then released your application using the Helm Chart it scaffolded for you when you initially ran draft create. Take a look at Kubernetes. Your application is running. So your app is up and running in Kubernetes, now what? Let’s make some changes to the Helm chart to get it deploying using a LoadBalancer (or NodePort if you’re using Minikube). Let’s also add a new Api Controller called NamesController that simply returns a JSON array of static names with a GET request. # Default values for c#. # This is a YAML-formatted file. # Declare variables to be passed into your templates. Run draft up again. Your app will get built and released again. This time you’ll have a LoadBalancer service exposed and your updated application with the new API endpoint will be available within seconds. Check the service’s External IP / URL and try it out by tacking on /api/names on the end to try out the new Names API endpoint. To take your app down and delete the Helm release, simply issue a draft delete on the command line. Draft really helps ease the monotony and pain of setting up a new project and getting it all working with Docker and Kuberenetes. It vastly improves your development cycle times too. Check it out and start using it to save time! This is a simple guide on how to deploy a multi-container ‘linked’ web app using Docker. If you have not yet installed or set up a Docker host to run the containers on, here is my guide on setting up a basic uBuntu 16.04 Docker host VM. The ‘web app’ we’ll be looking at how to deploy will consist of two basic components – a MySQL database for the back-end, and a simple PHP script for the ‘web front-end’ which simply connects to the MySQL container and displays some info from a database table. For the MySQL container we’ll be using the official Docker repo ‘mysql-server’ image, and for our web front-end, we’ll be creating our own Docker image using a custom Dockerfile we’ll craft ourselves, based on an uBuntu 15.04 image. Start off by creating a new directory in your home directory called ‘web01’ to create and store the Dockerfile we’ll using to build our custom web front-end image. Then create an emtpy file called ‘Dockerfile’ in this directory and edit it using your favourite text editor. I’m using nano for this. RUN – strings a few apt-get commands together to install apache, php5, and a few other tools like curl. This is important, as every RUN command in a Dockerfile creates a new image layer, and we don’t want our image to contain too many layers. The last RUN command grabs the content from a gist I created which is a basic PHP script, and places it in the /var/www/html directory in the container, then deletes the default index.html file that apache places there. This is the script that will connect to our MySQL container and display some basic info (our basic ‘web app’). EXPOSE – exposes port 80 so we can map this to our Docker host and access the website outside of the container. CMD – runs the apache2 service with PID 1 when the container starts. Now you can build the Dockerfile and create your own custom image, which is what will be used to start the web container later. Next, you’ll run a new container using the official mysql-server image from the Docker repository. You won’t yet have this image locally, but the command will automatically download the image for you. Note that I’ve called my container ‘db01’ and given it a root password of ‘MyRootPassword’. The -e parameter specifies that an environment variable called MYSQL_ROOT_PASSWORD inside the container should be given the value of ‘MyRootPassword’. The MySQL container then uses this environment variable to setup the root user for MySQL when the container starts. Now that the database container is up and running (verify by running ‘docker ps’ to check its running), you can deploy the custom web container using your image you created above. In this docker run command, you’ll also link the web container to the db01 container you previously started up using the –link parameter. This is important to link the two containers. The web container will be given environment variables with information telling it about the networking config of the DB container. These environment variables will then be access by the simple web PHP script to tell it where to find the database server, and what credentials to use to connect. Important: notice that in the –link parameter, the name of the database/MySQL container is specified. Make sure you use the exact name you gave your MySQL database container here – this ensures that the linking of the two containers is correct. The last ‘web01image’ bit specifies to base the container you are running off of the newly built ‘web01image’. Check that the new web container and previously created MySQL container are running by using the ‘docker ps’ command. You can see the environment variables that the PHP script grabs (top of the script) to establish the database connection from the docker container. These environment variables are what are created and populated by linking the web container to the db container using the –link parameter. Lastly, you may want to create a sample database, table and some data for the simple ‘web app’ to display after it connects to the database container. Issue the following ‘docker exec’ command, which will add the sample database, create a sample table, and add some sample data. Make sure you change the ‘MyRootPassword’ bit to whatever root MySQL password you chose when you ran the MySQL container above, and ensure you run exec against the name of the MySQL container you chose (I used db01). Keep the database name and the rest of the command intact, as the PHP script relies on these staying the same. Finally, browse to //dockerhostnameorip and you should see the simple PHP script display some basic info, stating it was able to connect to the MySQL server and display the sample data in the database. I’ve used this process multiple times to create quick Docker host VMs running on VMware Workstation in my home lab. 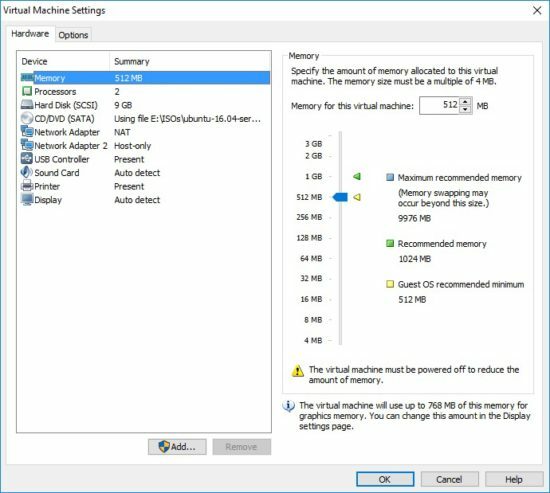 It is important to note that although I’m using VMware Workstation, the type 2 hypervisor you use here is fairly unimportant. You could just as well use VirtualBox, or Fusion for this purpose. 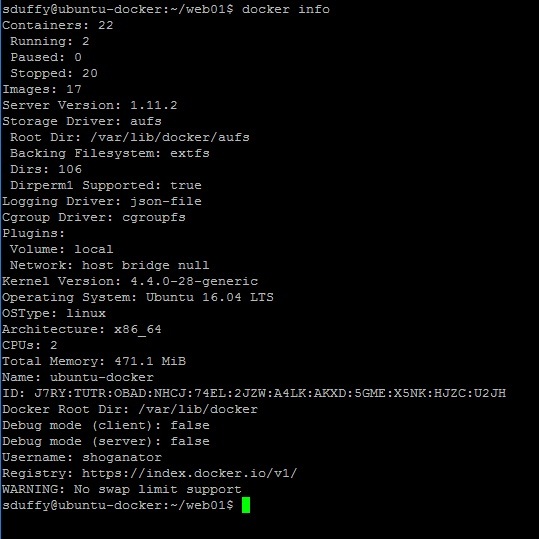 Create a new Virtual Machine for your Docker host using your type 2 hypervisor software (Workstation in my case). Attach the uBuntu ISO and start the VM up. Install a standard uBuntu OS using the text based installer, and just be sure to also install OpenSSH server when prompted for features to install. After the install completes, reboot, login with your user account you created during install, run ‘ifconfig’ to check the assigned IP address, and then use your favourite SSH client to connect to that IP. Using a PuTTy session will just make copy/pasting commands into your uBuntu VM easier. Now you’ll install docker – the package includes both the docker server and client. Run a quick ‘docker info’ command to ensure that you get information back from Docker and that everything looks OK.